Congratulations! You win 77 bonus points with this purchase! Very comfortable and easy to wear. Great if you have dry eyes. I wear them daily for a month then change. Being a clay pigeon shooter there is no doubt that using these lenses enable me to enjoy my sport more and I also find them very convenient in my everyday life. I use my monthly touch lenses for every day wear and am satisfied with the quality of product. Have been using these lenses for years and they are the best I have ever worn.my optician keeps saying they are a perfect fit for me. Using these for years now. Great product. Customers who bought these lenses also bought Solunate Multi-Purpose 2 x 400 ml with cases. 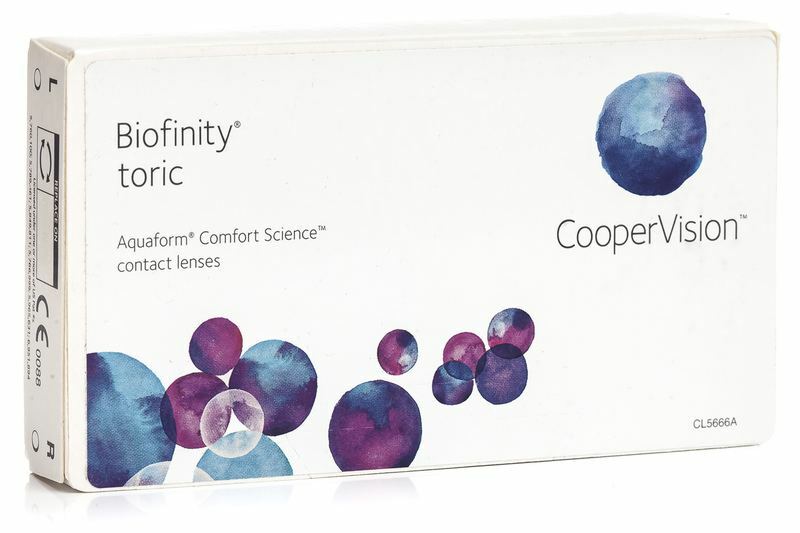 I have been provided with my prescription for my left eye Coopervision Biofinity Toric BC 8.7 DIA 14.5 PL or could be PX = Plano / -1.75 x 120. Is this sufficient to be able to order lenses or does my prescription lack the full detail? Hi Paul, If the 120 you mention is the axis, it should be enough. Hi Paul, Unfortunately the only one who can give you the correct advice is your Optician. Hello, I would like to buy your contact lens, but I forgot those parameters, Do you have some shops in london? Hi. We only sell online. Please check your details with your optician, who should issue you with a prescription. I hope my reply helped. Absolutely rubbish poor quality lens! Left my eyes feeling really dry and lead to recurring meibomian eye cysts. Also, eyes felt gritty and vision was blurred. I've been wearing lens for about 17years and never experienced anything as bad. Avoid these if you want clear vision and healthy eyes! Thank you for your feedback. I am sorry to hear that you had problems with the lenses. As for the quality of the lenses, these are same original lenses that you would buy anywhere. If you ever have any king of problems with the products you buy from us, you just have to send us an email and we will do our best to find a solution like send you new lenses or even a refund. Also, please make sure that you have ordered the correct lenses, because from what I can see, your last order on 16. 5. 2014, you changed the parameters of your lenses. But, I cannot exclude the possibility of a faulty lens from the manufacturer, that’s why I would like you to send me the batch number of the “faulty” product and your prescription. Please send us an email for further support as this is not the proper support channel. I'm intrested in your lenses but I'm wondering if I get a discount because I have the nhs tax credit exemption card . And if I can get a dicount what is it. You would be able to claim some money back using the form HC5(T) but we will not be able to reduce the entitled amount from a total value of the order. I believe that this is possible only at brick and mortar opticians.